My husband had some errands to run, and my high school daughter was playing with the band at an event. So, this left my son and I to occupy our time together. Since I had a workshop coming up, I suggested that we do some baking. The problem was deciding what to bake. I’d had a series of workshops recently and done a lot of baking so I was a bit tired of the same ol’, same ol’, which were a stock series of recipes which I usually make for the workshops because they’re quick and easy in addition to representing the various different substitutions I teach about in the workshops. My son’s suggestion was that we make cookies because we hadn’t made them in a long, long time. There was a reason for that…. I have found that cookies take longer to make, both in the assembling and in the baking. But my son was correct, that we hadn’t made any in a while, and they would be something different. So, we went to work creating a recipe. I decided that if we were going to bake cookies, I wanted to make something that would be quick. This meant beginning with what we had in the pantry and not creating everything from scratch. So, we opted to use a gluten free flour blend that I had already made up for another item and had leftovers of in the pantry. We also decided to use pre-chopped, store-bought dates which we found in the pantry as well. Because I’m always trying to be healthy, we chose to make oatmeal cookies with whole rolled oats, also in in the pantry, and to use coconut sugar instead of white sugar so I could use half the amount I’d have to use of white sugar. 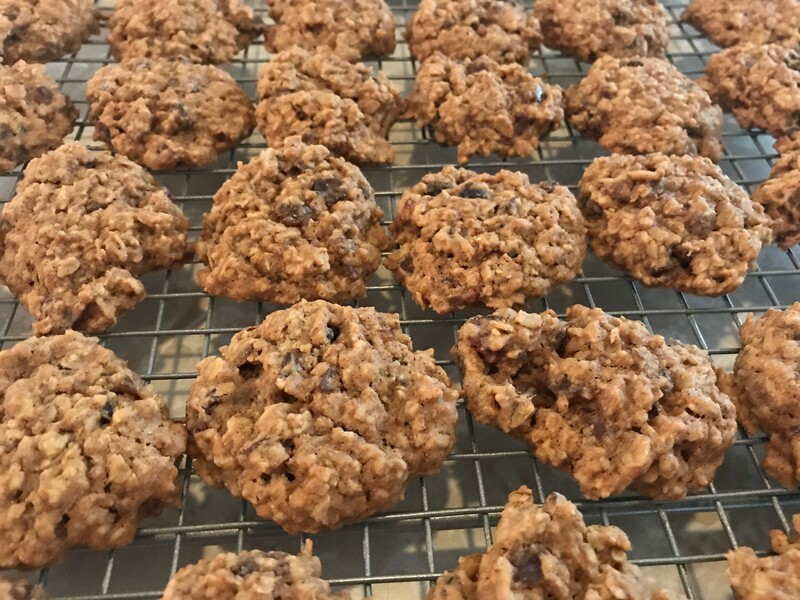 Using the mixer sped the assembling process up, and because we decided to make oatmeal cookies, we could simply drop the batter onto the parchment paper and flatten them without any rolling or forming. By using vegan butter, I minimized the spreading so I could put 16 cookies (the 1 tbsp size) instead of 12 to a cookie sheet which meant all the cookies fit onto just four cookie sheets, so I could bake two sheets at a time in the oven, resulting in only 20 minutes of baking time. The result was that from when we started rummaging in the pantry to when the second batch of two cookie sheets came out, it was less than 45 minutes. Now, those are cookies worth making!